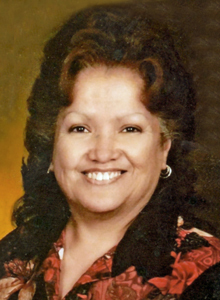 Services are scheduled for 9:30 a.m. Tuesday, April 18, at Our Lady of Grace Catholic Church for Juanita Carrasco Duran of Artesia. Duran, 66, passed away Sunday, April 9, 2017, at Covenant Specialty Hospital in Lubbock, Texas. Fr. Martin Cornejo will officiate at the services, with interment to follow at Woodbine Cemetery. Pallbearers will be Chris Reyes, Xavier Garcia, Carter Garcia, Timothy Galindo, Robby Galvan, Sunny Jaure, Dominic Duran, Lawrence Perez and Lorenzo Perez. Visitation will be held from 10 a.m. – 4 p.m. Monday at Terpening & Son Mortuary, with a rosary to follow at 6:30 p.m. at Our Lady of Grace. Juanita was born Oct. 1, 1950, in Carlsbad, the daughter of Isabel Jaure. She was a longtime resident of Artesia. On Dec. 1, 1980, she married Henry Duran Sr. in Pecos, Texas. Juanita was a homemaker and member of Our Lady of Grace Catholic Church. She loved spending time with her children and grandchildren. Survivors include daughters Bianca Duran (Anthony Carillo) of Hagerman, Victoria Duran Perez (Lawrence) of Artesia, and Corian Duran (Carter Garcia) of Hobbs; goddaughter Ashly Campos of Artesia; stepdaughters Marina Chavarria (David) of Lake Arthur, Henrietta Delgado (Raul) of Artesia, and Nancy Hernandez of Hobbs; stepsons Henry Duran Jr. (Felicita), David Duran (JoAnn), Ismael Duran and Eddie Duran (Lily), all of Artesia; brothers Diosdado Jaure and Ricky Galvan, both of Carlsbad, Joe Carrasco of Livingston, Texas, and Ruben Galvan of Lamesa, Texas; sister Martha Montoya of Carlsbad; and numerous grandchildren and great-grandchildren. She was preceded in death by her husband, Henry Duran Sr., on May 8, 2016; her parents; son Christopher Carrasco; and brother Francisco Jaure.